These concerns were raised by several Board members as well as concerned citizens, yet the majority of the Board approved Gonser’s nominees. Supervisor Gonser nominated Danny Beer, who is NOT a resident of Oakland Township, but owns Lyon Gear in the Southwest Quadrant of the Township. The vote for filling this position was then taken. Danny Beer was appointed by a 4 to 3 vote. Gonser, Reilly, Thalmann and Giannangeli voted in support. Buxar, Bailey and Langlois voted against the appointment. Supervisor Gonser nominated , Gary Kwapis, an Architect who lives in the Southwest quadrant of the Township to replace Barbara Wolak. Janine Saputo (one of only two women on previous PC) reiterated the recommendations made by Chair Jim Carter, and asked the Board consider reappointment of Barbara Wolak to the Planning Commission. Langlois did say that she would support Gary, but would not vote for another person from the Southwest Quadrant of the Township. The vote for filling this position was then taken. Gary Kwapis was appointed by a 5 to 2 vote. Gonser, Reilly, Thalmann, Langlois and Giannangeli voted in support. Buxar and Bailey voted against the appointment. Supervisor Gonser nominated, Anthony Scaccia, a Builder and Real Estate Broker who lives in the Southwest quadrant of the Township to replace Roger Shultze. Anthony is also currently an appointee to the Tax Board of Review. After his introduction, Anthony admitted that he was not able to ‘focus fully’ on his responsibilities on the Tax Board of Review because his clients were ‘trying to reach him’ during the reviews. Resident Frank Ferriolo commented that the Planning Commission is going to be ‘out of balance’. He went on to say that the only time he has seen Mr. Scaccia at Township meetings is after Gonser asked Scaccia if he would consider being appointed to the Township Board (McKay replacement) or Planning Commission (Roger Shultze replacement). The vote for filling this position was then taken. Anthony Scaccia was appointed by a 4 to 3 vote. Gonser, Reilly, Thalmann and Giannangeli voted in support. Langlois, Buxar and Bailey voted against the appointment. The Planning Commission is now populated with 5 new Gonser appointments. Danny Beer does not live in the Township, but his business is in the Southwest quadrant of the Township. 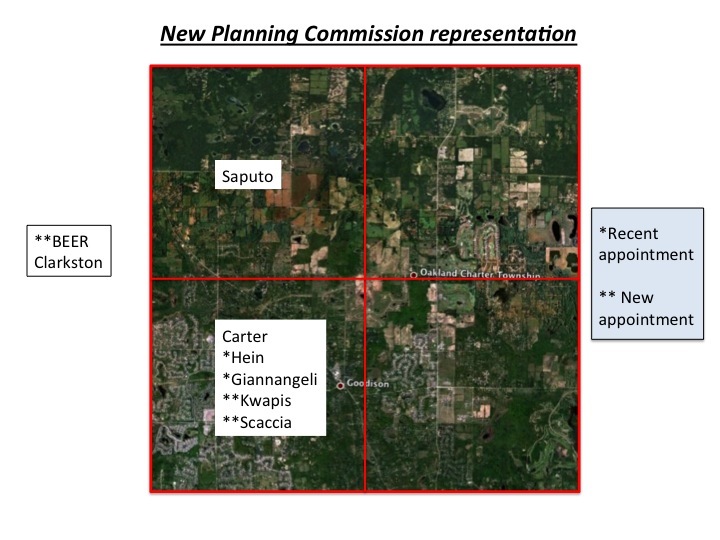 Clearly the Planning Commission no longer has the geographic diversity that Planning Commission Chair Carter had requested. In fact, Jim Carter’s recommendations fell on ‘deaf ears’. Why is this important to the citizens of Oakland Township? Gonser has stated he wants to take the Planning Commission in a ‘new direction’. 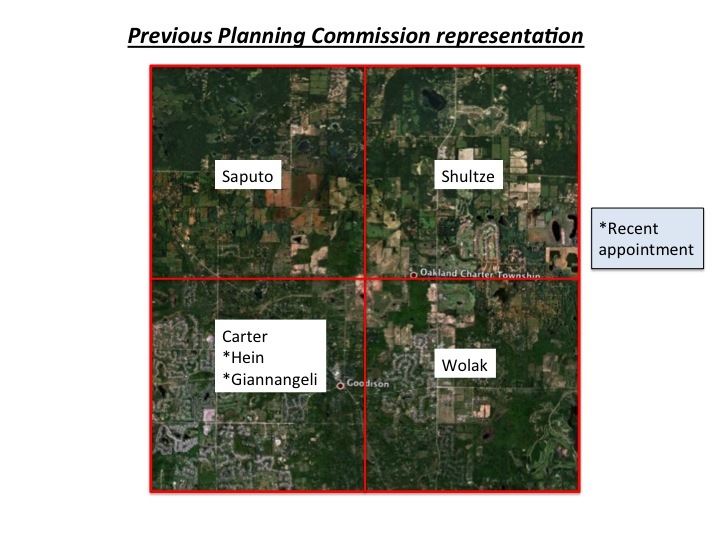 He has not publicly stated what his ‘vision’ is, however, he has told Planning Commissioner Ron Hein that he intends to provide the Planning Commission with ‘strategic direction’ to use in formulating our new Township Master Plan. The Master Plan has historically been a ‘bottoms up’, citizen input process. Gonser will now make this a ‘top down’ process. The citizens of Oakland Township need to get involved in the Master Planning process so it does not become “Gonser’s Plan” based on input from builders, and real estate brokers. Your input is critical! One final point. I was a member of the Tax Board of Review in the 80’s. I was also a member of the Planning Commission for over 26 years. Anthony Scaccia’s assumption that the Planning Commission appointment will be less demanding of time is not based on fact. His appointment to the Commission not only violates the appearance of a conflict of interest, but raises questions why the Board would have appointed someone who has already demonstrated that he cannot commit the time to a previously appointed position. Are you a “subdivision rat”? Supervisor Gonser expresses his opinion! This entry was posted in Board split?, Planning and Zoning, Supervisor Gonser and tagged Gonser, Jeanne Langlois, John Giannangeli, Maureen Thalmann, oakland township, Oakland Township Board, Planning and Zoning in Oakland Township, Supervisor Gonser, Supervisor Terry Gonser, Terry Gonser, Trustee Thalmann on August 24, 2014 by richardjmichalski.